A new CBS News/New York Times Battleground Tracker estimate finds the Republicans positioned to take the Senate this year, with a likely 51-49 seat edge if the November election were held right now. The margin of error on that current seat estimate, at plus or minus 2 seats, means Democrats still have a real possibility to keep the chamber and that we head into campaign season with control up for grabs -- with a closely-divided Senate surely coming in 2015 in either case. The data is based on more than 100,000 interviews conducted online for CBS News and the New York Times by YouGov exclusively as part of this joint project, with samples for every individual Senate race and House race, oversamples in competitive races, and each matched to the demographics and voter characteristics in the states and districts. The current Senate is 55-45 Democratic. Republicans' current edge looks like enough to win at the moment, but that edge is politically tenuous and statistically narrow. It's based on a string of razor-tight races that are all-but tossups, notably one-point race estimates that narrowly favor the GOP in Louisiana, North Carolina, Iowa and Michigan. In the model, those slim leads translate to close wins in most scenarios. There are other combinations of states they could win, under less likely scenarios; but the tight underlying estimates underscore the fact that these races could still go either way. In sum, this is a tight race for control of the Senate, full of close individual races across the country. In addition to estimating the most likely balance of power in the Senate, the model can tell us about individual races. Plugging in the online panel data, we can run many simulations of the model to see how likely it is that the Democrat or the Republican will win in a given state. The most likely outcome, again, is 51 Republican seats to 49 Democratic seats -- but many different scenarios can lead to that result, to say nothing of the possibilities if we include other likely outcomes (a 50/50 or 52/48 split, for example). The pickups are likeliest to come in places we've long suspected Democrats would have a tough time: conservative-leaning Southern states Arkansas, Louisiana and North Carolina, where Democratic candidates had an easier time when in a more favorable climate in 2008. Meanwhile, two spotlight races in Georgia and Kentucky have the Democrats hoping for pickups of their own, but these estimates show Republicans would still win there if today were election day. In Kentucky, Senate Minority Leader Mitch McConnell would likely win today in his race against Democratic Secretary of State Alison Lundergan Grimes. And in Georgia, Democrat Michelle Nunn would fall short in her quest to defeat GOP nominee David Perdue for that state's open seat. But those races remain close as well -- the Republicans do not prevail in every potential scenario. There may be some surprise in the Iowa and Michigan findings, where we estimate slight Republican wins in these open seats being vacated by Democratic senators. Republicans have labored to expand the playing field beyond their southern base, and the results from Iowa and Michigan provide some indication they can do that. But those races remain very tight. Elsewhere, though, we see larger leads for Democrats -- in Colorado, for example, and in New Hampshire, where Senator Jeanne Shaheen would comfortably defeat former Senator and possible GOP nominee Scott Brown. Those results suggest the playing field is not expanding quite as far as Republicans might like. Our simulations also show Alaska's Democratic Senator Mark Begich slightly favored to hold onto his seat. Some previous public polling (though there hasn't been much) has suggested a toss-up, perhaps due to the relative dearth of reliable survey data. The model incorporates all available information about a state's voters in addition to demographic and historical data, and our estimates go in the direction suggested by the evidence. Regardless of how the individual outcomes combine, this map illustrates the estimated winner for each state -- that is, which party's candidate won the larger share of simulations in our model. Not including the special elections, there are 14 solid Republican races and 11 solid Democratic races. Seven seats "lean" Republican, meaning that the candidate wins in most of the simulated races but by a smaller margin. Finally, two seats lean Democratic. 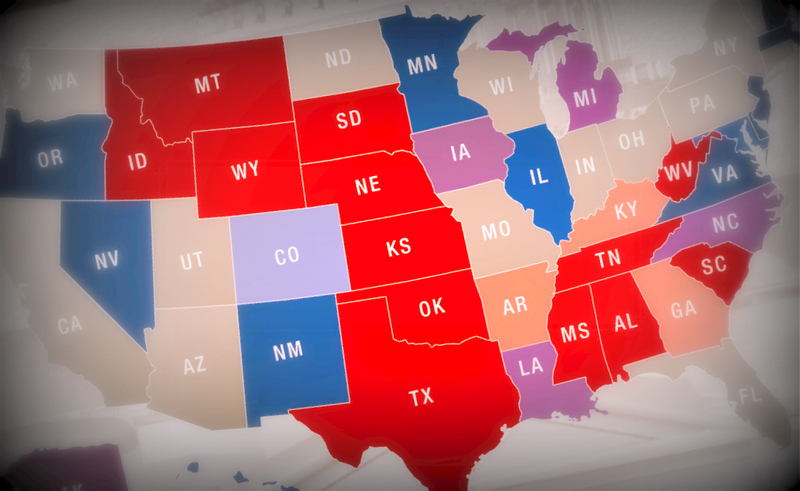 Based on the current data, the simulation gives the GOP a 70 percent chance to win control. The GOP even stands a good chance of securing as many as eight pickups in this current estimate, which would bring their tally to 53 seats, but the data also point to a real possibility that the Democrats hang on to their majority, if by a narrow margin. We have created a panel of over 100,000 registered voters who will be interviewed four times between July and November. The panelists come from each of the 50 states and 435 congressional districts. They are interviewed on the Internet and have been weighted to be representative of registered voters in each congressional district using data from the U.S. Bureau of the Census and other sources. The weighting variables are age, race, gender, education, 2012 vote for president and Congress, and party identification. As with any survey, the estimates are subject to sampling error with larger samples usually giving more accurate estimates than smaller ones. Panelists were selected disproportionately from the most competitive states and Congressional districts to provide more accurate estimates for these races. However, with 435 Congressional districts, we have smaller samples in some, especially the least competitive. To say anything about the overall outcome of the election -- which party will control the House and the Senate in the 114th Congress -- requires estimates for every House and Senate race, even in places where our sample is too small to make those estimates very reliable. We have quite a bit of information about the people that are not in our sample and the races in those districts. From the Census, we know their demographics. From the 2012 election returns, we know the proportion who voted for each candidate in 2012 (or didn't vote). From the 2012 exit poll, we know the relationship between voter demographics and 2012 vote. And from out 2014 panel, we have data on how these variables relate to 2014 voting intentions. Anthony Salvanto is CBS News Elections Director. Doug Rivers is Chief Innovations Officer at YouGov, professor of political Science at Stanford University, and a CBS News consultant. Andy Guess is a CBS News Broadcast Associate and doctoral candidate at Columbia University.